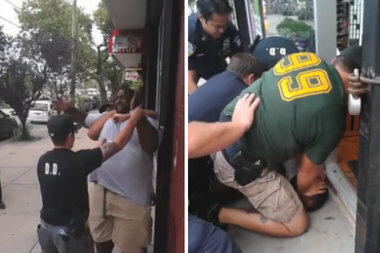 ST. GEORGE — A Staten Island grand jury voted Wednesday not to indict an NYPD officer caught on video putting Eric Garner in the chokehold that caused his death, the district attorney said Wednesday afternoon. The decision prompted a furious reaction from family members and some elected officials, including Mayor Bill de Blasio, and triggered a series of protests around the city. Garner's wife, Esaw Garner, called the incident a "modern-day lynching" and said an apology from the officer, Daniel Pantaleo, means "absolutely nothing," according to MSNBC. "The condolences and remorse should have been on the ground when he was asking them to let him breathe," she said on the Rev. Al Sharpton's "Politics Nation." "His apologies and condolences mean nothing to me now." "It’s so lonely. It's so sad." The mayor called it a "very emotional day" for the city and said that "no family should have to go through what the Garner family has went through." The decision hit very close to home regarding his son, Dante. "Chirlane and I have had to talk to Dante for years about the dangers that he may face,” said de Blasio, who announced a federal investigation into the case. Dramatic surveillance video showed Pantaleo with his arm around the Staten Island father's neck as a group of officers wrestled him to the ground to arrest him for selling untaxed loose cigarettes on a Tompkinsville street in July. Garner can be heard telling officers "I can't breathe" several times as officers grappled with him. 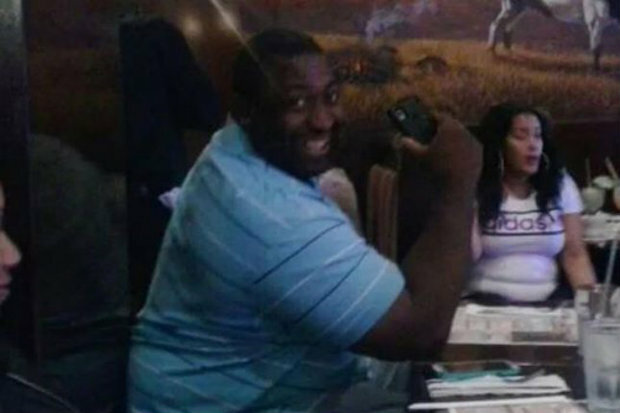 The medical examiner ruled his death a homicide by chokehold, with Garner's asthma, diabetes and obesity as contributing factors. "I'm actually astonished," Garner family lawyer Jonathan Moore told NY1 after the decision. "He will not die in vain,” she said. Pantaleo apologized in a statement released Wednesday afternoon through a police union. He still may face departmental or federal charges. "I became a police officer to help people and to protect those who can't help themselves," he said in a statement. "It is never my intention to harm anyone and I feel very bad about the death of Mr. Garner. My family and I include him and his family in our prayers and I hope that they will accept my personal condolences for their loss." But Garner's wife rejected his olive branch. "I don’t accept his apology, no," she said. "I couldn’t care less about his condolences." The visibly angry wife said she couldn't believe the grand jury's decision. It was "like they aren’t seeing what I saw" in the video, she said. "[Pantaleo] goes home to his family," Esaw Garner said later at a press conference held by Sharpton. "He's still feeding them. My husband is 6 feet underground." The decision capped a four-month investigation that covered 38 interviews from civilian witnesses, EMS workers, expert witnesses, police and others before taking the case before a grand jury, according to a statement from Staten Island District Attorney Daniel Donovan. "Clearly, this matter was of special concern in that an unarmed citizen of our county had died in police custody," Donovan said. Donovan also said he has asked a state court to allow him to release to the public evidence presented to the grand jury. Garner's death touched off protests across the city, including an August march of 3,000 people on Staten Island, also caused the Civilian Complaint Review Board, the watchdog agency for the police, to review the 1,022 chokehold complaints they received from 2009 to 2013 across the city. On Wednesday night, groups of protesters mobilized around the city, including hundreds in Times Square, Union Square and Grand Central Station, where they staged a "die-in." Linder Hampton, 59, of St. George, took her lunch break to visit the courthouse where the grand jury deliberated. She has two sons, 32 and 35. Sharpton called for national protests in the coming weeks to highlight the problem of police brutality and to call for changes in policing minority communities. “It will not get too cold. It will not snow too high. This will be a winter where we freeze out police brutality,” he said. The decision comes a week after a Ferguson, Mo., grand jury's decision not to indict a police officer who shot unarmed 19-year-old Michael Brown over the summer. That decision sparked protests nationwide, including New York. Protesters clogged Manhattan streets on Nov. 24 and 25, shutting down the FDR Drive, Triborough and Manhattan bridges. NYPD's Community Affairs Chief Joanne Jaffe tweeted out the only police department comment regarding the decision.